Product content can make or break an online shopper’s buying experience. It’s important to provide customers with detailed product descriptions so they know exactly what they’re looking at and can make informed buying decisions. If your products lack accurate, complete and consistent content, you’re likely losing potential customers because they don’t have enough information to make a final purchase. The data supports this: Salsify surveyed online shoppers about the factors that impact their online buying decisions, and out of 1,000 respondents, 88 percent said product content plays an extremely or very important role in their purchasing decisions. 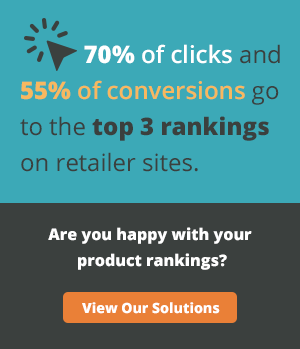 94 percent said they will either abandon a site or not buy a product at all if they can’t find they information they need to make a purchasing decision. Are you looking to create high-quality product descriptions at scale? 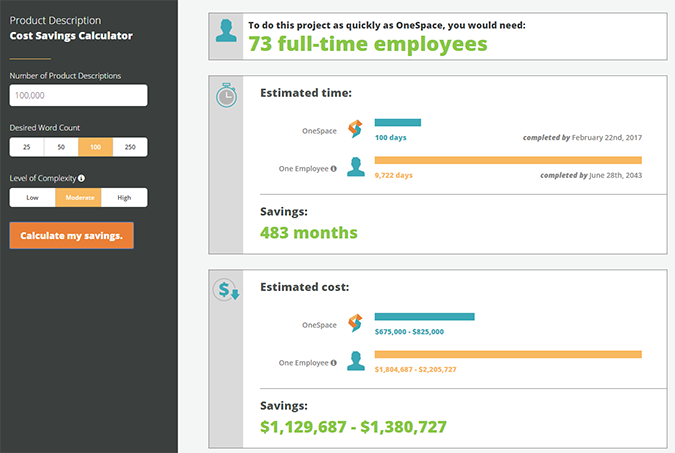 Use our interactive cost savings calculator to see how OneSpace’s network of e-commerce experts can save you an average of 54% over hiring additional full-time employees. 14 of the top 30 online retailers use OneSpace to create their product content, including Staples, Sears, Overstock.com and Lowe’s. Overstock.com realized an 84 percent boost in its organic traffic after it used our on-demand workforce to refine attributes and optimize descriptions for over 100,000 different products. Want to see more use cases? Visit our Clients page.